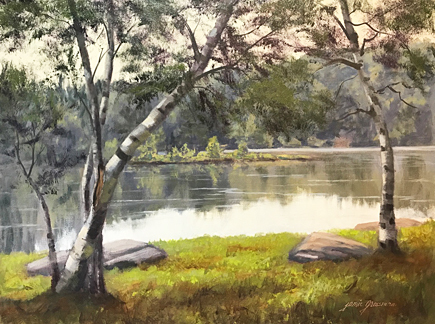 I have a large oil painting commission to do of a scene along the Hudson. 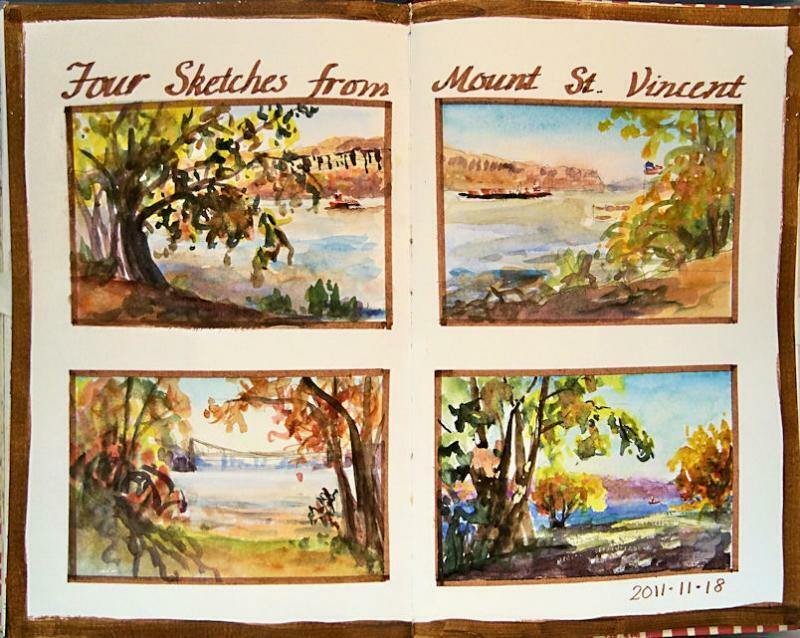 The other day, I grabbed my sketchbook and watercolors and headed down to the location to do some preliminary sketches to discuss with the client, before proceeding on the large piece. It was freezing cold along the river early in the morning, but I know from experience that the light on the cliffs of the Palisades leaves early. By the time the sun is well overhead, they are all in shadow. I bundled up with my warmest coat, hat, scarf and mittens, and worked as fast as I could! Word from the client: "I love them all!" So, I'll be combining some elements for the final painting. 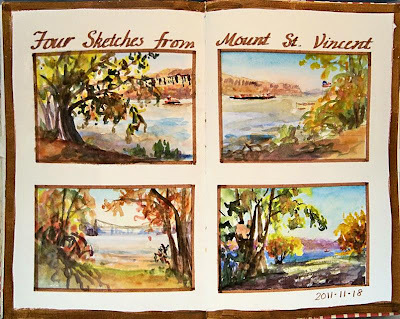 I taped off the rectangles to do the sketches while I was out on location. That kept my borders clean. I already knew what the dimensions of the large painting would be, so I stuck to those proportions. Once I got home, I drew in the borders around each sketch with a calligraphy pen, and used acrylic paints on the outside border, mixing colors to match the inside border's ink color. When finished, I painted a layer of Golden Interference Gold Fluid Acrylic, diluted with gloss medium, over the outer brown border. Although it doesn't show in the photo, there is a beautifully subtle gold sheen on the outside edge of the page. I would have a hard time picking from your small paintings since each one is lovely...so I don't blame the customer. Can't wait to see what you do. Hope you had a great Thanksgiving.